WHAT IS THE "PROGRAM MODE" AND HOW WOULD YOU USE IT? The Chocovision Rev V, Rev Delta & Revolation 3Z offer offer a programming feature and we are going to discuss this in more detail to see when and how this feature would be beneficial to your workflow. 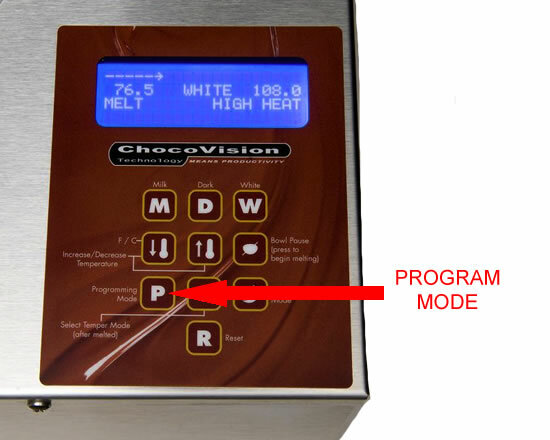 As noted in a previous features article, Chocolate Type, all of the Chocovision tempering machines have preset programs for milk, white and dark chocolate with the standard melt and temper default temperatures. So, all you have to do is select the type of chocolate you are using (Milk, White or Dark). Once selected the machine will start the melt cycle at the appropriate temperature for the chocolate you chose. Most of the machines allow you to manually adjust the pre-set melt or tempering temperatures, using Manual Temperature Adjustment, if your chocolate requires a different temperature. The Program Mode allows you to take this a step further! With the Program Mode you can save your custom temper temperatures for each chocolate type or simply choose your own melting, delta, or temper set point. Once the desired temperature is set it can be recalled at a later time over and over, so you can quickly and easily access your saved "recipes" for future use - and not have to manually adjust the temperatures each and every time! (Illustration shows P button on the Rev 3Z, button may be in a slightly different location on other models). How to set the Program Mode? 1) To enter Program Mode, press the "P" button while machine is in its start-up state. 2) Select a recipe "A" through "Z" (or DARK, MILK, or WHITE) using the UP and DOWN ARROW buttons. 3) Advance to the other menu items (TEMPER POINT, TEMPER DELTA and MELT POINT) by pressing the "P" button. 4) Use the UP and DOWN ARROW buttons to adjust the desired temperature settings for TEMPER POINT, TEMPER DELTA and MELT POINT. 5) To run a recipe, remain in Programming Mode and select the desired recipe using the UP and DOWN ARROW buttons. Press the "S" button to execute that recipe. 6) Hit the RESET button at any time to save changes and exit Programming Mode. Note: There are also pre-set recipes for "DARK", "MILK", and "WHITE" chocolates. Changing the temperature settings in programming mode for these recipes WILL change the machine defaults. How would you use the Program Mode? If your chocolate's melt and/or temper point differs from the default setting, or maybe you create bean to bar or raw chocolate which requires very specific temperature adjustments? Save your adjustments once and access them anytime you need them! Manual temperature adjustment allows you to quickly and easily create and access your own recipes, so it will increase the speed and efficiency of your workflow when working with customized, exotic or hard to temper chocolate!